Last summer, First Solar and California grid operator CAISO ran a set of tests to show that utility-scale solar PV, instead of being a disruptive influence on the power grid, could actually help stabilize it. Over a series of days in August, First Solar slightly curtailed power output at a 300-megawatt solar farm in California, enabled its array of inverters, and plugged into CAISO’s system. It then orchestrated the plant’s output to follow CAISO’s automatic generation control (AGC) signals, respond to its frequency regulation commands, and use inverters for voltage regulation, power factor regulation and reactive power control. The results, according to a report released last week, showed that First Solar was able to meet, and sometimes exceed, the frequency regulation response usually provided by natural-gas-fired peaker plants. First Solar was also able to provide inverter-based services throughout the day -- and possibly even at night. It turned in a respectable performance matching CAISO’s wholesale market price signals -- even when clouds appeared on the afternoon of the second day of testing, reducing First Solar’s capacity to shift its load. All told, the data from CAISO, First Solar and the Department of Energy’s National Renewable Energy Laboratory (NREL) indicates that a utility-scale solar farm, equipped with standard inverters and software controls, can serve to smooth out grid fluctuations from the solar itself or from other sources. 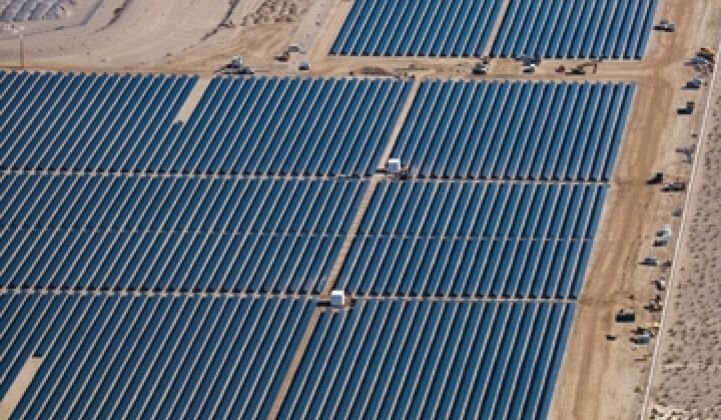 And for California, a state with 9,000 megawatts of transmission-connected solar and plans for 20,000 megawatts more by 2030, that could be a valuable resource. “If PV-generated power can offer a supportive product that benefits the power system and is economic for PV power plant owners and customers, this functionality should be recognized and encouraged,” the report noted. Utility-scale solar PV is already causing California some grid challenges, in the form of the duck curve -- a deep midday drop in net load driven by lots of solar flooding onto the grid, and a steep ramp-up starting in the late afternoon that extends into evening as solar fades away. 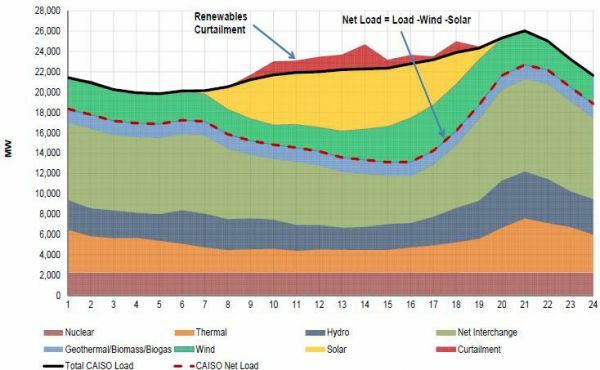 CAISO is also experiencing “periods of oversupply conditions, especially pronounced during weekends when electricity demand is low and renewable production is high.” Currently, when faced with potentially destabilizing conditions like this, CAISO has no choice but to curtail renewable power. “Significant levels of renewables curtailment took place during certain days of the spring of 2016,” the report noted, including one day in late April when more than 2,000 megawatts of renewable generation had to be taken offline. The only blips came in the afternoon, when clouds passed over the plant, reducing First Solar’s output and shrinking the headroom needed to maneuver. “However, even during these periods the plant was demonstrating good AGC performance by closely following the commanded set point,” according to the report. Where PV and inverters really shine, however, is in frequency regulation, with inverters that can respond much more quickly than spinning generators. “The plant demonstrated fast and accurate frequency-response performance for different droop settings (3% and 5%) under various solar resource conditions for both under and over-frequency events,” the report found. 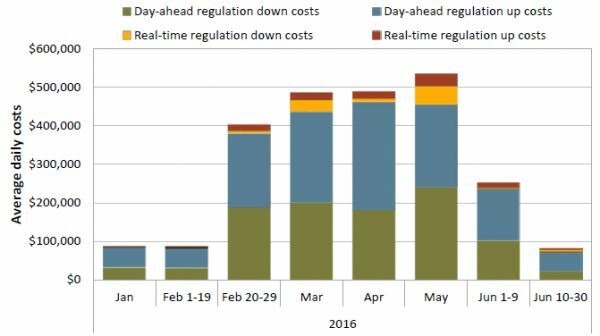 CAISO has been increasing its payouts for frequency regulation over the past year, in part to manage the grid instabilities that come with an increasing share of intermittent wind and solar power. 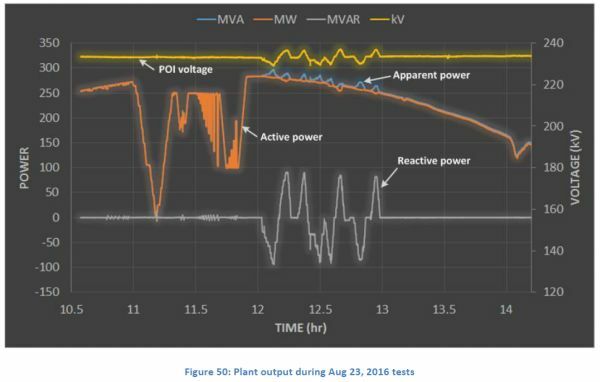 In fact, looking at the test data, “a conclusion can be made that regulation accuracy by PV plant is about 24-30 points better than fast gas turbine technologies.” CAISO is working on implementing national rules that require grid operators to reward fast-responding frequency regulation assets, such as grid-tied batteries, electric vehicles, fast demand response, or, in this case, solar farm inverters, and “data from these tests will be used by the CAISO in future ancillary service market design,” the report noted. Most of the PV control capabilities used by First Solar and CAISO are technically feasible today and “a few areas throughout the world have already started to request or require PV power plants to provide some of them,” the report said. One example is Hawaii, with utility-integrated projects like the ones that SolarCity and AES Energy Storage are building on the island of Kauai. "In the United States, utility-scale PV plants are rarely recognized as having these capabilities and typically are not used by utilities or system operators for electrical grid services.” That’s largely because the economic and regulatory models for rewarding it aren’t in place yet. That’s important, because the kinds of tasks First Solar performed last summer required it to curtail overall output, to offer some “headroom” to make changes according to CAISO’s commands. For example, it curtailed output by 30 megawatts, or about 10 percent, to give it maneuverability to follow CAISO’s AGC signal -- although the report noted that “relatively small and short-term energy storage” could help mitigate cloud impact and other uncertainties in that process. First Solar also had to curtail output to provide frequency regulation, although just how much it would need to curtail would depend on what its service might be worth in CAISO’s coming market redesign. CAISO, NREL and First Solar are planning to explore the “economic and/or contractual incentives to maximize production and not hold back production to provide reliability services” as one of the next steps in the research. Join GTM for actionable conversations on the future of electricity in our nation's most innovative energy state. California's Distributed Energy Future 2017 will be held in San Francisco, March 8-9. Learn more here.